The Knitting Pirate » In Which the Pirate Changes Gears. « In Which the Pirate Challenges the Laws of Physics. In Which the Pirate Changes Gears. 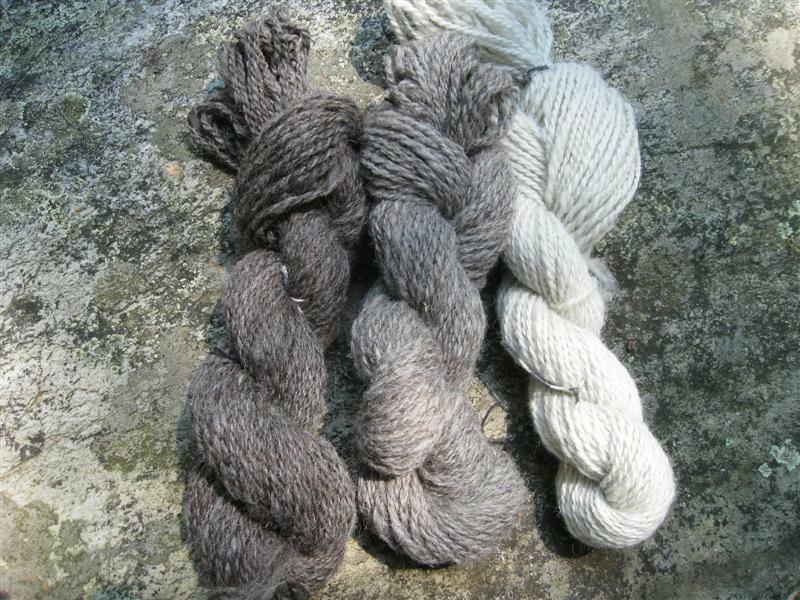 The three Jacob colours have been skeined up, though not washed yet. I'm starting to see more of a difference between the dark and medium now that they're off the bobbin. Whew! The white and medium gray came to 92 yards each, and the dark is 104 yards. That will be more than enough to knit a hat with yarn left over to braid onto the ends of the earflaps for an extra-adorable pigtails look. I've been thinking about cutting my hair short when it starts to get cold again, so I won't be able to make any pigtails of my own. As long as I had the skeiner out, I wound up this three-ply corriedale that I'd finished just before the Tour de Fleece began. 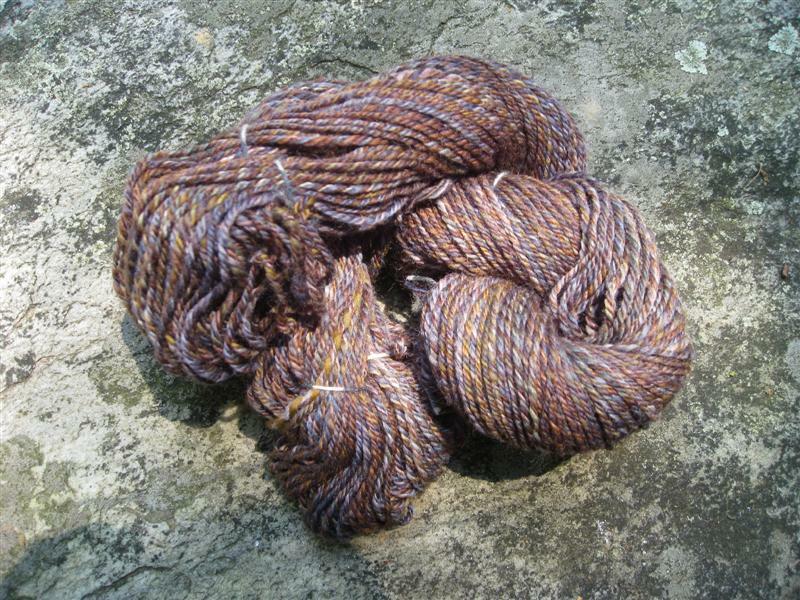 It came to a total of 218 yards from six ounces of fiber, and I'm really pleased with the subtlety of the colours. There are two knots in the skein, which I can spit-splice when I come to them, but it was easier to make one big skein than three little ones. It's not washed yet either, which is why it's still so curly at the ends. I expect it to come out of the bath with lots of bounce and squoosh (that's a technical term). Right now I have no idea what to knit with this yarn, unfortunately. Into the stash basket it will go, to await the next brilliant idea! 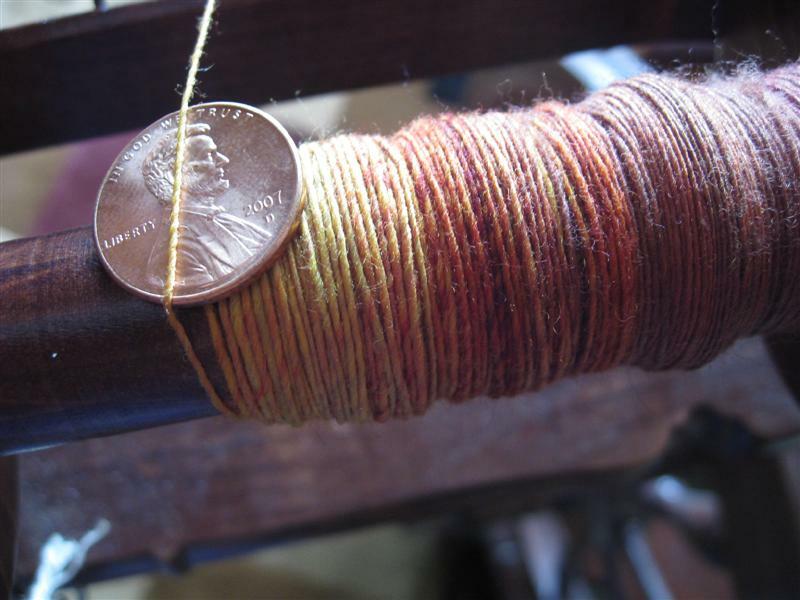 This entry was posted on Tuesday, July 6th, 2010 at 08:00 and is filed under fiber, spinning, tour de fleece 2010. You can follow any responses to this entry through the RSS 2.0 feed. Both comments and pings are currently closed. Lovely! I do like the colors of that rambouillet!